Whereas Laura Marling brings you down leafy lanes, sits you on top of barges in summer canals and strums the shimmering strings of her acoustic guitar whilst musing on the plight of the soul, Siv Jakobsen cracks the ice inside her, splintering shards across a desolate landscape, whilst staring into the flames of a cottage fireplace never once escaping melancholy for whim. When she sings it’s like she is sharing your pyjamas, sitting in your breakfast, you can taste her breath on your face. Her vibrato quivers and shakes and connects the strands between your heart and your mind and when the string section awakens, she leaves the tingling threads of her slight accent probing your daydreams as you wonder for whom she longs, to whom she is addressing her words (“let them slip my throat”) who does she miss, what are her regrets, her hopes and fears? Two songs, To Leave You and Change seamlessly connect as if she had moved on emotionally in mid song. “I’m pealing off my skin and pulling all my seams apart”. On Shallow Digger she conjures up Nick Drake as a woman dancing in a desert tent. I see jewels and veils until she sings you back into her room, back into her head – she can transport you at will. On Crazy she is the simple pure essence of beauty, like Joni Mitchell in heaven, first contemplative, alone with her guitar and a distant whispering angel and then the soft pulse of a bass and drum accompany the play of love – harmonizing with herself in ecstatic throes she is suddenly gone. Blanket follows immediately, again guitar and voice and then strings that evoke emotional landscapes, escapades, intrigue and adventures of the heart. She seems to finish the song and then – an afterthought, a fleeting return and as quickly gone in the mist. Like I Used To begins a capella and builds to the line “you don’t love me like you used to” and has you sinking into her sadness as she tries to escape the reality of her unfaithful lover, leaving her helplessly still in love. In her next song she sings “I’m on my own, I’m not alone” and later “life is short and love is rare”. Sometimes she reminds me of a more organic Stina Nordenstam and other times sharing the same sentiments as Damien Rice (The Blowers’s Daughter) but with each listen she owns the room on her own. Low key, finger strummed or picked guitar and that vocal pressed up against the glass, impossible to ignore. I can’t catch all her words, hidden in the folds of her trembling voice but with repeat listens they become clearer and enhance the music, improve the experience as if in their revealing you are suddenly allowed to touch her. Berry & Whythe seems to be about two graves somewhere in New York between which she and her lover must be buried. It’s here that the words become indistinct (see link below) and you crane forwards to the speakers so as not to miss the story, not to miss the feelings, not to miss the sharing of the love or the tragedy. As the album draws to a close and the penultimate message of We Are Not In Love has you wondering if this is a broken lover’s concept album? “Your heart is only happy in its grave”. You can hear her lips opening as she whispers the title at the end of the song. On Space, the album’s last song, piano appears for the dying moments of this engaging work, strings rise up from the dark caverns of the soul, she hums along, she waves goodbye, collapsing into solitude. 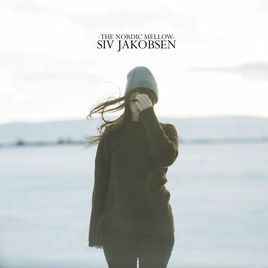 Siv Jakobsen is a wonderful, atmospheric, melancholy Norwegian who has the skill of making you close your eyes and be still for 3o breathtaking minutes, bewitched by her voice and her haunting songs on this captivating and beautiful album.